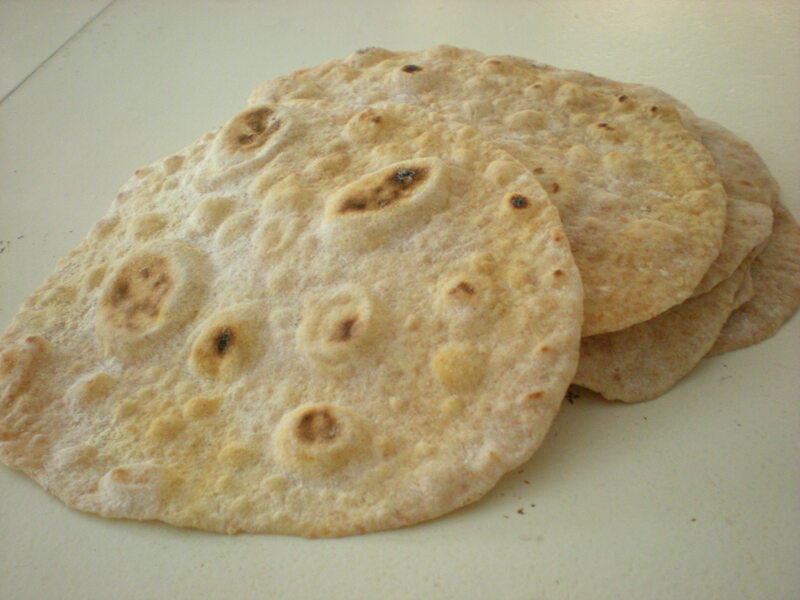 Soft Whole Wheat Flour Tortillas | happyspinach etc. I’m going to be headed out to California in less than a week now (Wow! Time flies!). In the process of getting ready, I’ve been putting together some food to take on the plane. One of the things I’ve decided to bring are tortillas because they’re bready, soft, and pliable–a lot more flexible in terms of space compared to crackers. Another great thing is that you can make oodles of them and just store them in the freezer. They reheat in just a split second and taste almost as fresh as when you pulled them off of the griddle. In other words, I’m making like a Boy Scout and “being prepared” before the packing rush begins. The tortilla recipe itself is incredibly easy, just a bit time-consuming. It’s definitely a great lazy weekend afternoon-buster if you make a mega-batch. Or you could just invite a couple of friends over for a tortilla-making party! Regardless, these are great to have tucked away. They can make a quicky Mexican dinner of canned pinto beans and jarred salsa seem a little bit more thoughtful and homemade. I imagine that you could even slightly modify the recipe to make wraps instead. Just use a more flavorful oil (such as olive or sesame seed) and throw in some herbs. Then I would probably divide the dough into only 8 sections instead of 12, and roll them out into rounded rectangles rather than circles. And then, of course, my little Mankitten had to assist in the photography. 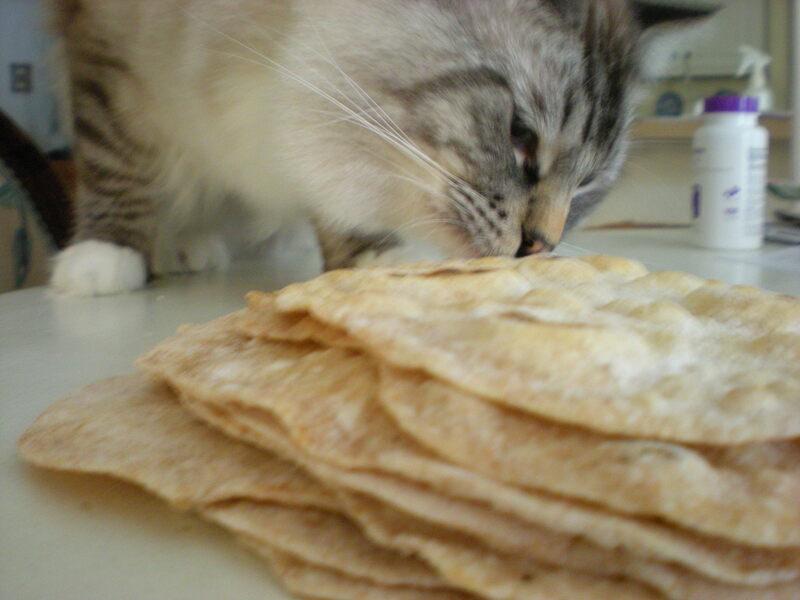 No worries though, he never actually made physical contact with the tortillas. Mix together the flours, baking powder, and salt in a medium bowl. Rub in the oil, stir in the water, and knead lightly into a soft dough. Return to the bowl (don’t worry about cleaning it) and cover with plastic wrap. Allow to rest for 15 minutes. Divide dough into 12 equal sections and roll into balls. Cover all of the balls except one with your plastic wrap to keep them moist. Take the uncovered ball of dough and roll it out on a lightly floured surface into a 15-18 cm/6-7 inch round. Repeat with the remaining dough. In a preheated, dry, heavy skillet (I, of course, love my cast iron skillet here), add one tortilla and cook for 1 1/2-2 minutes, flipping as soon as the surface starts to bubble. The tortilla should remain soft and flexible. You want to do this over pretty high heat, but not so high that your pan begins to smoke. Remove from the pan and either cool on a cooling rack if you are going to be storing right away, or keep warm wrapped in a clean dish towel if you are going to be eating soon. Repeat with the remaining tortillas. This entry was posted in Bread, Mexican, Vegan, Wheat and tagged Cast iron, Flat-bread, Mexican, Tortillas. Bookmark the permalink.